You probably have a general idea of what microneedling is and what happens during and after a microneedling procedure. If not, you’ve at least heard of the amazing, anti-aging results microneedling produces. MDPen is a top-notch provider of microneedling equipment for practitioners. From proprietary, all-natural microneedling serums to microneedling pens and brochures, MDPen aims to be the one-stop shop for practitioners. We also offer microneedling training for those interested in adding microneedling to their practice. But do you know what goes on inside your skin that produces a reduction in acne scars, skin pigmentations, and a decrease in wrinkles? 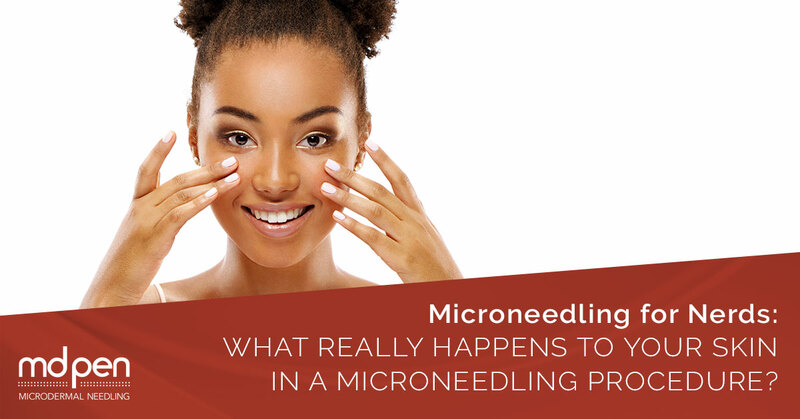 MDPen explores microneedling in depth in this blog post. Collagen induction therapy as microneedling was originally known as has been around since the 1990s. Microneedling was initially for skin rejuvenation, but has since been used successfully on a wide range of skin conditions, including but not limited to acne scars, post-traumatic/burn scar, alopecia (hair loss), skin rejuvenation (which would include anti-aging conditions), drug delivery, hyperhidrosis, stretch marks, and skin discolorations. Microneedling is regarded as a very safe, effective, and minimally invasive cosmetic procedure. The microneedling pen or device has come a long way since the 1990s,when tattoo guns were used. In 2006, a drum was devised (known as a dermaroller) that is in effect a round drum with needles attached that you roll over the skin. The needles are short (usually 0.5 -3 mm in length) and puncture just the top layer of your skin, the stratum corneum (the scientific name for the epidermis or outer layer of the skin) without damaging the epidermis to any significance. These were originally used only one time and then discarded, which is still popular today, especially for at home microneedling. WHY PUNCTURE THE SKIN IN A MICRONEEDLING PROCEDURE? Micropuncturing the skin produces a controlled skin injury and leaves the actual epidermis undamaged. Damaging the epidermis usually produces scars when healing, which would be counterintuitive to microneedling. Minimal bleeding is involved as the injuries are tiny, but the process of healing is set in motion. Various growth factors such as platelet derived growth factor (PGF), proteins in the connective tissues as well as growth factors in the connective tissue and fibroblast growth factor (which play a role in cells proliferating) are released. With regards to scarrings, the needles break down the old scar strands and allow them to revascularize (restores blood circulation, which allows the scars to heal). Five days after a microneedling procedure, a matrix forms under the skin for the collagen to be deposited on, which can last for up to seven years. For this to occur, the microneedlings have to be 1.5 mm in length. Microneedling has been around long enough for studies to be done. One shows that with four microneedling sessions spaced one month apart, collagen and elastin deposited increased by 400 percent in a lower layer of the skin. Furthermore, the collagen fibers that have been laid down as a result of the microneedling procedure have a normal lattice pattern as opposed to scar tissue that has parallel layering. Microneedling in essence fools your body into believing it has been injured. Thus, cell activity is increased as the release of various proteins, potassium and growth factors from cells as well as fibroblasts converge on the site of the “injury,” inducing collagen production. Skin is tightened, and scars are filled up. Microneedling takes only about 10-20 minutes once your skin is numbed by BTL numbing cream. The patient most likely had a consultation with the microneedling practitioner ahead of the actual procedure that explained the importance of diet, water intake, and vitamins A and C for maximal collagen formation. The microneedle is applied to the desired treatment area in a pattern. With minimal downtime, most patients tolerate microneedling very well. Microneedling treatments are most effective when performed at 3 to 8 week intervals and multiple sittings are usually required to achieve the desired effect on the skin. The final results won’t be visible immediately because new collagen continues to be laid down for approximately 3 to 6 months after treatment has ended. Microneedling enhances the delivery of drugs since the needles bypass the upper layers of the skin and deposit the drug directly to the dermis (the lower layer of the skin where connective tissues and structural components of the skin such as collagen, elastic fibers, and matrixes are found). This is why microneedling has recently been combined with radiofrequency (RF). At-home microneedling, while offering advantages, is not the most effective way to achieve the results you desire. Needle depth is key to treat different conditions, which can only be done with a professional microneedling device that can adjust needle depth. Furthermore, every person and desired results is different, so a professional microneedling practitioner can assess your condition properly and treat it to the best effect. Good micro needles have a high ratio of tip length versus diameter. In general, for treating acne and other scars, a micro needle length of 1.5–2 mm is usually recommended. To treat ageing skin and wrinkles, the needle length of 0.5 mm or 1.0 mm is the norm. IS A MICRONEEDLING PROCEDURE PAINFUL? When the micro needles are short, only up to 0.5 mm long, the microneedling procedure is essentially painless. However, the longer the needles and the further the depth of the needles, the more pain will be perceived. Again, every individual is different and the thickness of your particular skin is a factor in pain. Having thick skin pays in microneedling! Microneedling was first developed to treat scarring. Microneedling is constantly evolving as doctors are discovering more uses for the procedure. Research is ongoing in microneedling techniques, instruments, and applications. Because the skin is an easily accessible organ, has an amazing capacity for regeneration, and the results can be seen, the skin will continue to be studied with regards to other conditions and diseases microneedling can be applied to. Laser hair removal and genetic diseases are currently being studied. Microneedling is clearly a valuable technique with the number of applications only expanding by the day. MDPen is on the forefront of this research. Our mission is to improve the lives of people every day. We do this by supporting our practitioners who have the joy of seeing the improved results in patients today. Microneedling can change lives by improving people’s appearance, which has ripple effects in all areas of their lives, from family to work to self-esteem and accomplishments. If you wish to learn more about microneedling and its amazing applications, please visit our News page. There you will find in-depth articles on how microneedling treats various conditions as well as advances and trends in skin care. Visit our Shop page as well for all of your microneedling equipment needs. From setting up your clinic with brochures, featuring microneedling before and after photos of our patients to purchasing our amazing MDPen Microneedles themselves, you’ll find everything you need. We offer financing on our microneedling pens as well to help you get started. We believe passionately in changing lives. If you are interested in our mission and passion, join us in a micro needling training course. Contact us today! #SkinMadness coming to your office!